Most Catholics can recite the Hail Mary but haven't actually reflected on the meaning of the prayer. Blogger and author Sarah Reinhard invited forty of the most popular Catholic voices, including Lisa M. Hendey, Lisa Mladinich, and Brandon Vogt, to write a brief reflection on one word of the Hail Mary. In Word by Word, popular Catholic author Sarah Reinhard compiled an accessible, profound, and unique meditation on each word of the Hail Mary, one of the most important prayer traditions in Catholic life. Each of the forty reflections encourages readers to "slow down" with the Hail Mary and experience previously unseen dimension in the popular devotion, making it come to life in a new way. This unique, formative, and informative exploration of the beloved prayer is a gift to anyone who wants to be continually changed through it--learning to slow down and examine things more closely. The book is based on a blog series Reinhard facilitated with popular Catholic writers and social media experts, including Lisa M. Hendey, Brandon Vogt, Paula Huston, Kate Wicker, Pat Gohn, Kevin Lowry, Lisa Mladinich, Donna-Marie Cooper O'Boyle, Fr. Patrick Toner, and Jeff Young. Sarah Reinhard is a Catholic wife, mother, and writer living in Ohio. 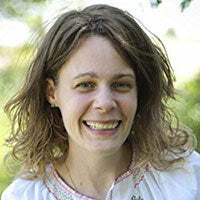 She writes at SnoringScholar.com in the midst of rural farm life with little ones underfoot. A convert to Catholicism, she's still learning what to do and when to do it, and she struggles (like so many others) with keeping sight of her faith in the midst of everyday life.